It’s fascinating comparing and contrasting tactics in warfare – and how propaganda has evolved since World War Two from the crude to the subtle. Recently I was watching a TV documentary about a specialist British army unit. They were a group of magicians and experts assembled to create an illusion to deceive the Germans in the North African desert. They created dummy tanks, fake communications and illusion to lead the Germans into attacking targets of no value. Apparently, they were so successful in their exploits right up to the crucial El Alamein battle. This group of amazing and resourceful people became known as ‘The Magic Gang‘. After the documentary, I started researching further and noted that some historians credit this group with turning the course of World War Two in favour of the allies. This may well be an exaggeration. But I think everyone agrees their purpose was to fight for our survival by deceiving the enemy. Here is a link to an article about them. I then turned my thoughts to events today and another group of deceivers who’ve received much acclaim. I suppose in some ways they could be described as today’s ‘Magic Gang’. Of course, I refer to the White Helmets. The White Helmets are a group set up to destabilise Syria. They do this by posing as humanitarian rescue workers when in reality they fabricate chemical attacks which are then blamed by our media and government on the Syrian state as a pretext for air strikes. Like the 1942 Magic Gang, they are directed and funded by the UK government. They only operate in Al Qaeda held areas. Unlike their predecessors, they were set up as agents of illegal regime change and to deceive the British public. There are other vast differences which will become obvious as you read on. Nowadays in our so-called liberal democracy, war inspired propaganda has to be far more clever and subtle – but still relentless. Certainly, on their own, the White Helmets are a pretty hopeless outfit and anyone with some intelligence and attention span can see straight through them. So how is it in the age of social media that for large numbers of people the penny still hasn’t dropped? I’ll explain. Al Qaeda, the White Helmets and possibly foreign intelligence agencies create a chemical attack on civilians or fabricate an event. This is usually near an area the Syrian Arab Army is winning battles against Al Qaeda. The supposed ‘atrocity’ is filmed and images are picked up by Western journalists (usually camped out in Beirut cafes miles away) and reported as fact. These images and reports are then circulated to the general media in the UK and elsewhere. The images are credited to ‘activist journalists’ in ‘rebel’ held areas – who are basically Al Qaeda with cameras. Conservative and ‘liberal’ press in the UK then unite in blaming the Syrian government and a relentless media frenzy follows. A few days later, without a shred of evidence against the Syrian government (and much to the contrary) the US, UK and France bomb Syrian targets. In the days preceding and following the air strikes former politicians like Tony Blair, David Cameron and David Miliband crawl out from the woodwork presenting the case on TV that the ‘activist journalists’ are reliable non-government organisations. I guess from a psychological perspective adding to the latest media circus is an attempt to dilute the magnitude of their own previous crimes in Iraq, Libya and Syria. And with all the misreporting, distortion and platitudes, large sections of the British people accept the false narrative. This is a cycle which has repeated since the wars in Former Yugoslavia and has been perfected in Libya and Syria. So that’s broadly how propaganda and warfare have developed since World War Two. In the UK the powers that be have evolved from deceiving the enemy to deceiving the public – and from the heroic “Desert Rats” to cowardly dirty rats. The modern-day Magic Gang are terrified of being exposed and there are some hopeful signs that more people are learning the truth for themselves. But more people need to get clued up. I’ll move on to conclude with some of the motives and perspectives involved, the risks to us all – and what we as citizens can think about and do. In the UK today, tolerance, diversity and respect is big business and we‘re always being lectured to about it by politicians. But how can this be squared with our destructive involvement in Iraq, Libya and Syria – equally diverse secular societies? How are these values compatible with our active support for extremist, terrorist sponsor regimes such as Saudi Arabia? Think about it for a moment. I believe most British people are basically good and have a sense of fair play. But I think many of us have become materialistic, self-absorbed, inward-looking and lazy. Successive governments have created this climate. They’ve dumbed down any serious debate on why in the 21st century we are still pursuing wars abroad. The government and media deceive us by constantly rebranding terrorist groups such as Al Qaeda as ‘moderate rebels’ or ‘freedom fighters’. I guess openly admitting post 9/11 that we fund this group would not sit well with the public. So 17 years after that event the deception and spin in numerous wars have been recycled to the point of absurdity. But on the domestic front, we’re being cleverly distracted away from this and manipulated by tribal issues such as immigration and BREXIT. As individuals, many of us are paying lip service to diversity and tolerance at home but have developed the mindset that fighting wars abroad or arming ‘rebels’ is normal and justified. I believe the war we’ve waged in Syria for many years has dehumanised its people and I would argue is shocking racism. We need to reset our values and sense of compassion to apply to all humanity. Promoting liberal values at home while pushing regime change abroad is pure dishonesty and hypocrisy. We need to stop creating wars and imposing ourselves upon people in other nation states. At every level, we have to stop judging other states by the standards we claim to live by. We have to stop preaching to countries in Africa, Syria or Russia about democracy or other issues. We need to allow other countries to evolve in these matters as we did and make their own choices. To do otherwise goes against the very values those in liberal circles claim to hold dear. 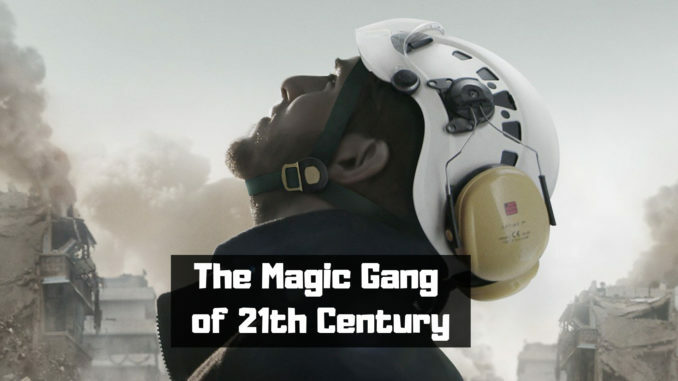 Idlib – the final White Helmets screenplay? This point affects us all directly if we don’t act soon. Events playing out in Syria right now look ominous. To informed observers who’ve followed the timeline of regime change, chaos knows the UK doesn’t want peace to break out in Syria. With no less than ten states outside of Syria with vested interests in the outcome of the war and with the looming battle to liberate Idlib from Al Qaeda, the risks of escalation are higher than ever. The 2018 Magic Gang are currently planning another chemical fabrication to draw the players into open conflict. The only way to prevent what seems inevitable global conflict is for people to research, engage and then remove treasonous cancer which has taken over parts of our government, intelligence services, media and others profiting from endless war. Admittedly not all the people within these cliques are homicidal maniacs in the Bolton, McCain or Clinton fold. There’s a mixture. Some are dishonest opportunists and self-promoters – motivated by the next pay cheque. Perhaps the majority – for example in large parts of our media and House of Commons, are simply ill-informed or victims of ideology and institutionalised groupthink. I think we need to focus our efforts on educating the misinformed and encouraging the distracted masses to research. We’ve all been on this journey before with Iraq and Libya and this alone should make anyone question the narrative we’re being fed about Syria. But with Syria, we need to act urgently. It’s evolved into a full-scale proxy war scenario with the risks now off the scale. Yesterday’s Magic Gang had a role in saving us. Today’s seem hell bent on destroying us – and they just might succeed.